Have you always wanted to try your hand at cheese-making, but you've thought it would be way too complicated? Like yogurt making, some cheese making isn't nearly as hard as you might think. Certain cheeses are easier than others for beginners, and mozzarella is one them. (Hurray!) 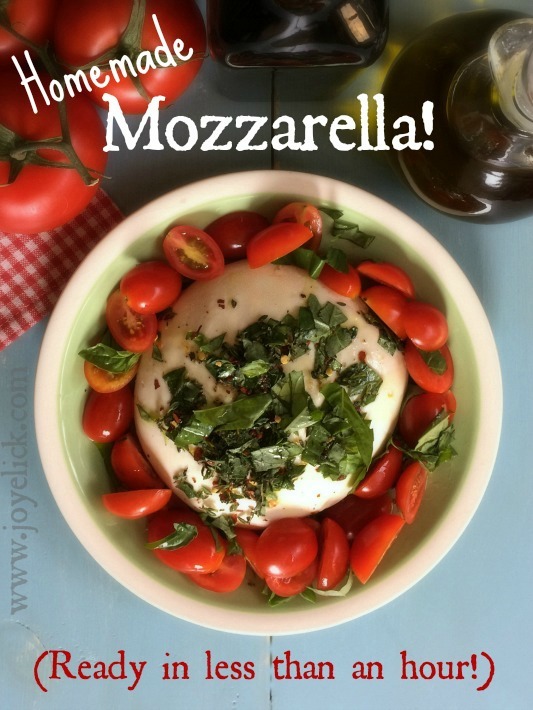 I use mozzarella more than any other cheese. I use it for pizza, lasagna, even my enchiladas. 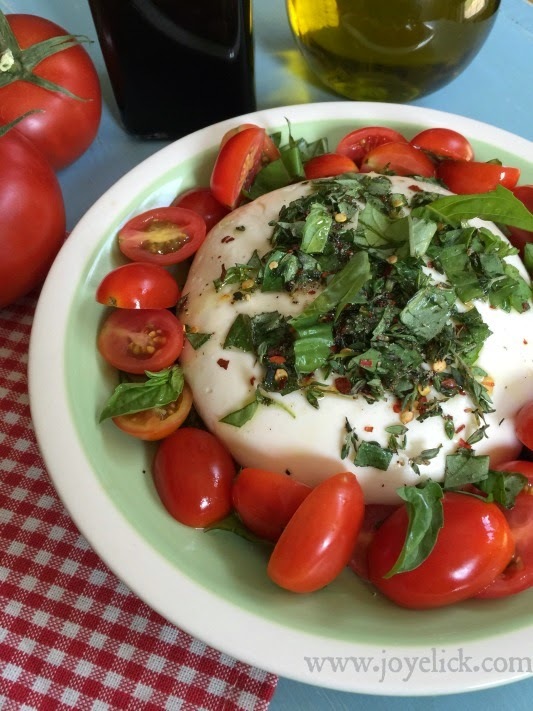 But homemade mozzarella is so smooth and silky, you may just eat it right there on the spot! Knowing how to make your own cheese and yogurt is a huge step toward self-reliance, yet many assume it must be way too hard to do. My hope is that today's tutorial will help inspire you to break into cheese making. Before we get started, there's a couple details to cover in order for today's cheese-making adventure to go smoothly. You need to gather the right equipment and make sure you're using the right milk. I like a beverage thermometer with a 6 1/2 inch stem and a dial face. This type of thermometer is easiest to read and therefore more accurate. A thermometer with red dye that shoots up a tube of glass is hard to read. It varies too much with different angles and it's awkward to use. It's much more convenient to clip a thermometer to the side of the pan and read a dial. Also, a dial type of thermometer shows the temperature as it heats and cools, where the other only shows how hot it gets, but has to be shaken down and re-inserted to get a current (cooled) temperature. A good thermometer doesn't cost very much, and if you're serious about making cheese and yogurt, it's a worthwhile purchase. 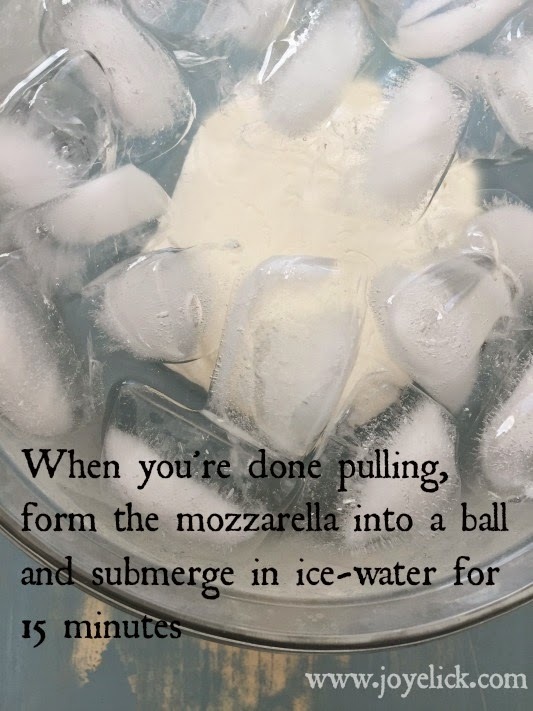 You can make mozzarella with almost any milk, even dry milk (but there's a little different set of instructions for dry). Your milk can be cow's milk, goat's milk, and anywhere from skim to whole. One thing to keep in mind; the more butter fat, the more flavor your cheese will have. 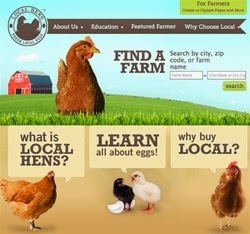 Try to buy organic milk for the best quality cheese (and I think organic works best, too). Whichever milk you use, it's super important that it's "pasteurized" and NOT "ultra-pasteurized." If you try to use ultra-pasteurized milk, it WILL NOT work. Step 1: Prepare the rennet and citric acid. 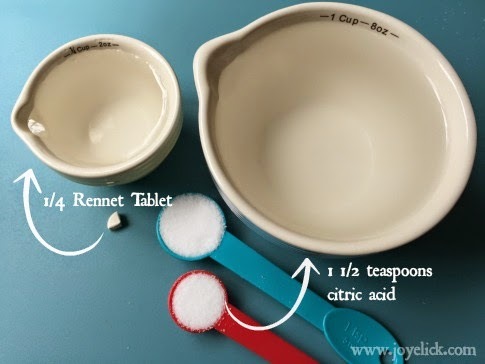 If using a rennet tablet (which comes in the kit mentioned above), cut off 1/4 of the tablet and dissolve in 1/4 cup cool water. Store the remaining pieces of tablet in the freezer, wrapped in plastic. 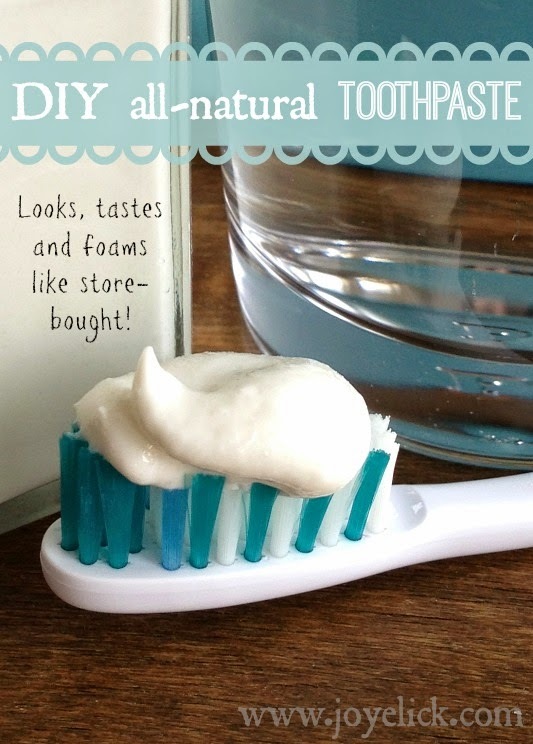 (If using liquid rennet, simply add 1/4 teaspoon to 1/4 cup water and stir). Set aside the rennet and water for later. Next, add 1 1/2 teaspoons citric acid to 1 cup cool water, stir to dissolve. 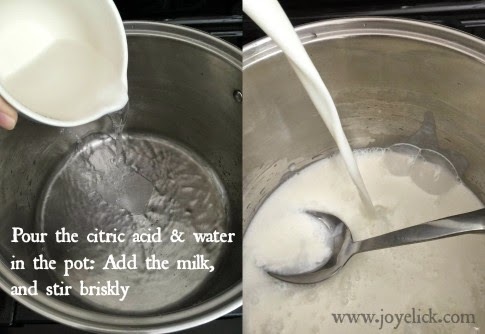 Step 2: Combine the citric acid water with the milk. Pour the citric acid and water mixture into the pot. Add the milk and stir briskly to combine. You'll notice a slight thickening of the milk as it reacts with the citric acid. Step 3: Heat to 90 degrees. Clip the beverage thermometer to the side of the pan. Heat the mixture over medium-high heat, stirring constantly until it reaches 90 degrees. Step 4: Add the rennet mixture. Remove the pot from the burner. 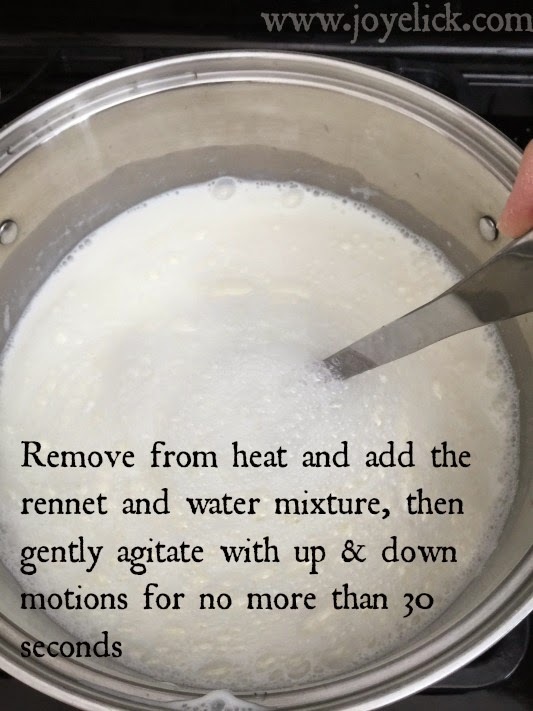 Slowly pour the rennet and water mixture into the milk mixture, stirring gently with up and down motions only. You want to agitate the mixture slightly to mix, but it's important not to stir too vigorously. By adding the rennet, the process of forming the cheese curd begins almost immediately. Gently stir with up and down motions for 30 seconds and then stop. Step 5: Cover and leave alone for 5 minutes. 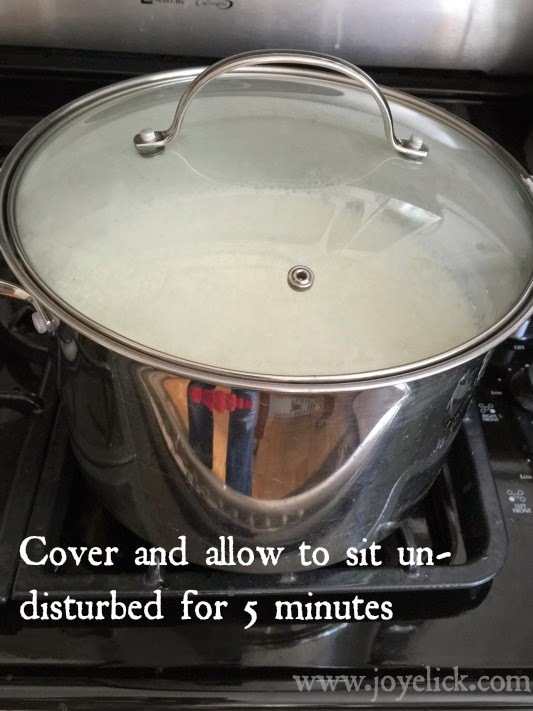 It's important to not disturb the pot while the curd forms. Use this time to heat a separate pot of water to 185 degrees. 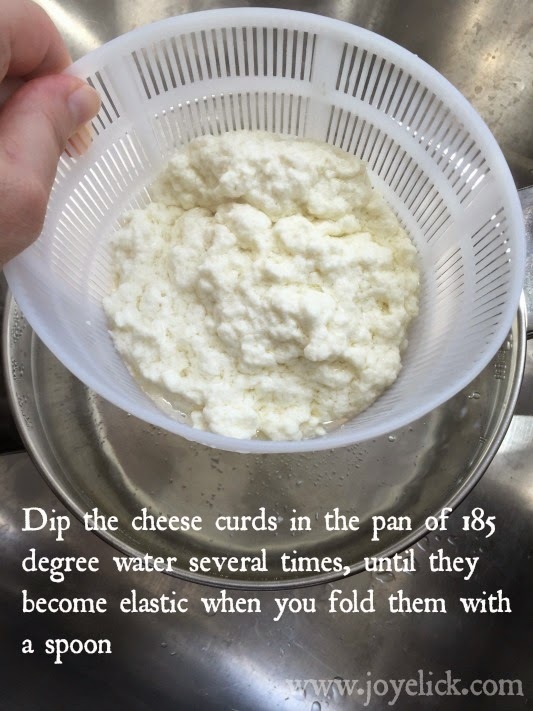 You'll use this for the water-bath method to prepare the cheese to pull. (The kit mentioned above contains instructions for both the water-bath method and a microwave option that's supposed to go a bit faster. But I personally try to avoid microwaves, so I do the water-bath method). Step 6: Check the curd. After the pot has sat, it's time to check the curd. It should now have formed a mass that looks a bit like custard, with a clear separation between the whey and curd. The whey will look yellowish and watery. If it doesn't look separated enough, or if the whey still looks milky, you can leave it for another few minutes (2-3). (If the curd still does not form, your milk may be the problem. It may not have been fresh enough, or it may have been ultra-pasteurized, even if labeled as only pasteurized. 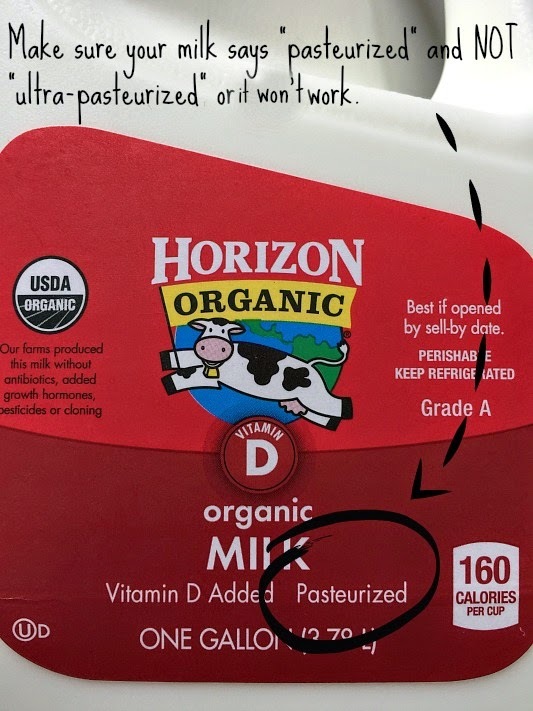 For organic milk, Horizon is a good brand to use). Step 7: Cut the curd. 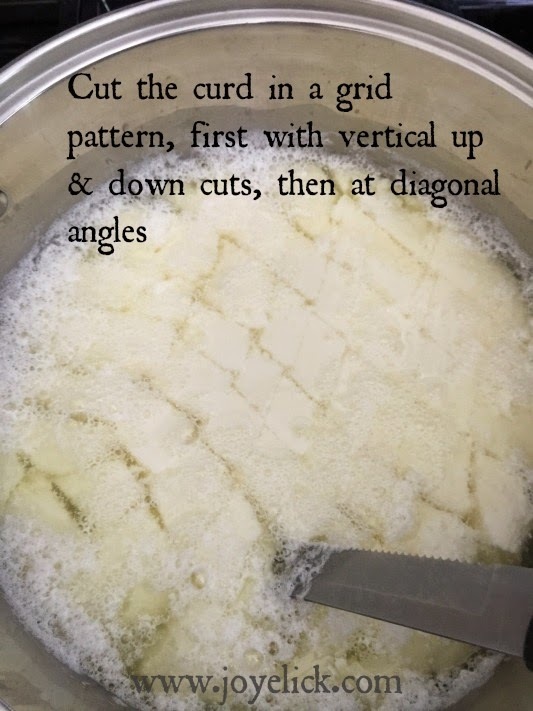 Using the long knife that reaches to the bottom of the pot, cut the curd in a grid pattern. Cut first while holding the knife vertically at a 90 degree angle to the bottom of the pan. Next, tilt the knife at a 45 degree angle and slice the curd in another grid pattern. This action will cut the entire curd from top to bottom into cubes. (Remember to check the separate pot of water you set to heat while the curd formed. Is it at 185 degrees? You'll be using it momentarily). Step 8: Re-heat the contents of the pot to 110 degrees. 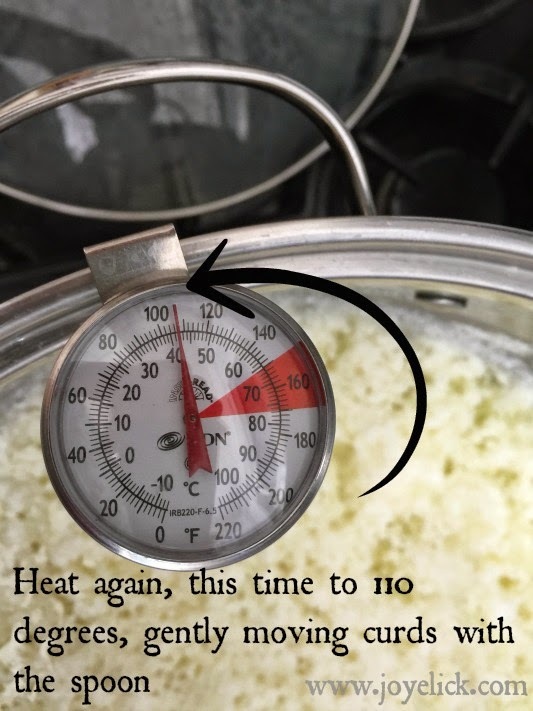 Clip the thermometer back to the side of pot with the cheese curds. Over medium-high heat, cook the curds and whey mixture to 110 degrees, stirring slowly. 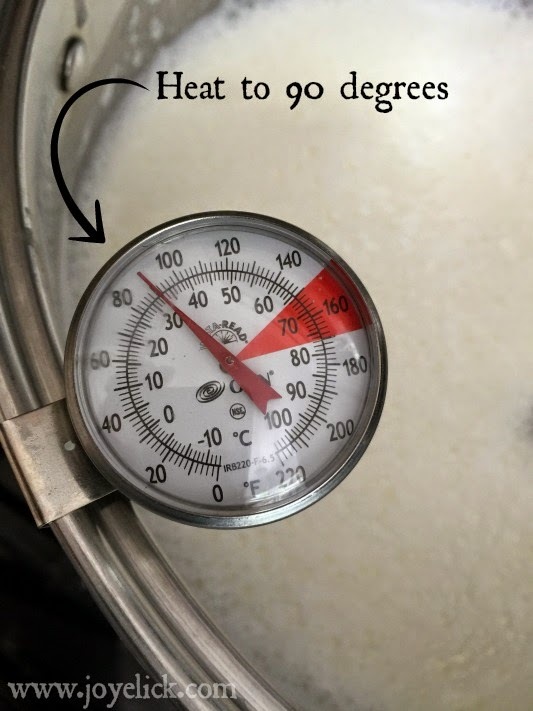 When the curds reach 110 degrees, remove from heat and slowly continue to stir for another minute. Step 10: Remove the curds from the whey. 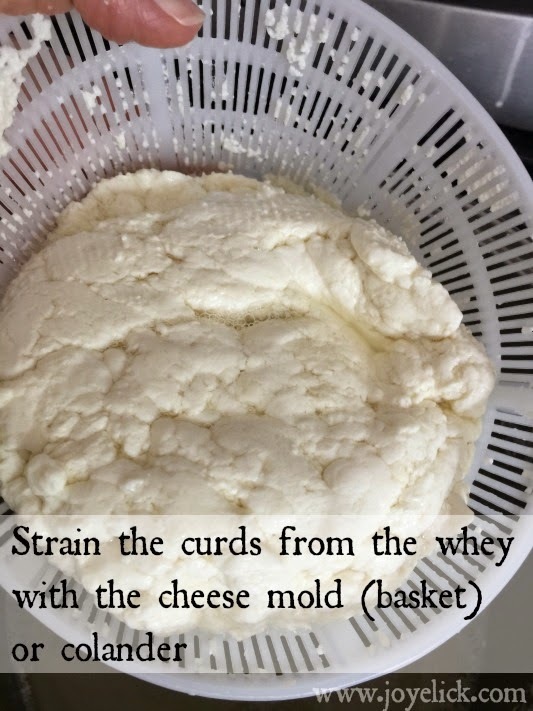 Using the slotted spoon, ladle the curds from the whey and place them into the cheese mold. Roll the cheese mold around like a wheel to help drain as much whey as possible. 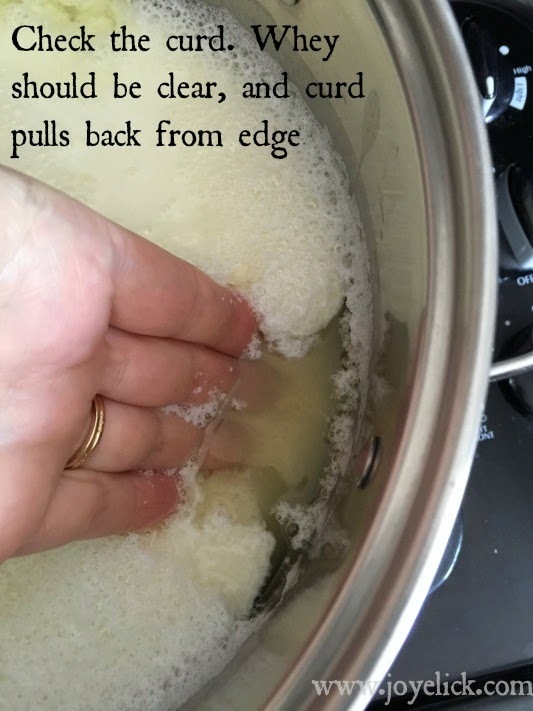 You can fold and press the curds gently with a spoon to help expel more whey, but keep in mind, the more you work them like this, the firmer your cheese will be when it's done. Step 11: Dip the curds into the hot water bath. 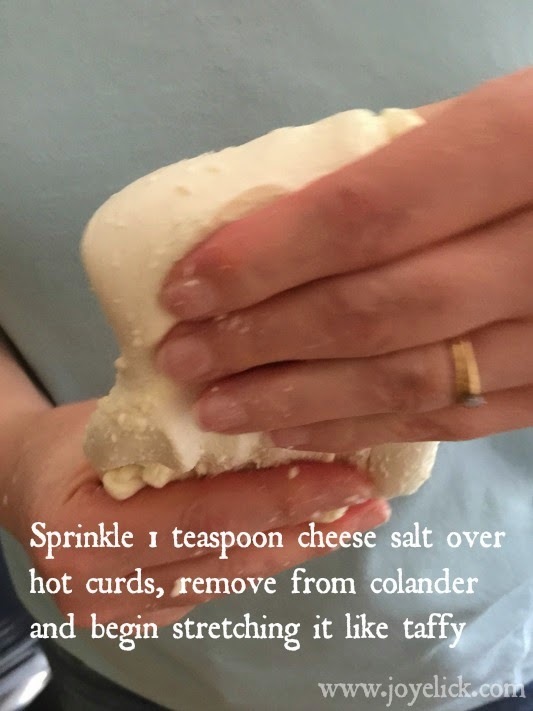 Being careful not to burn yourself, dunk the cheese curds in the cheese mold into the hot water. Hold them there for a minute, then check them with a spoon. They are ready to pull when they look stretchy when folded. It may take a few times of dunking before the curds start to look a bit like melted mozzarella when you fold them with a spoon. Step 12: Begin pulling the cheese. Sprinkle 1 (or 1 1/2) teaspoons cheese salt over the hot curds. 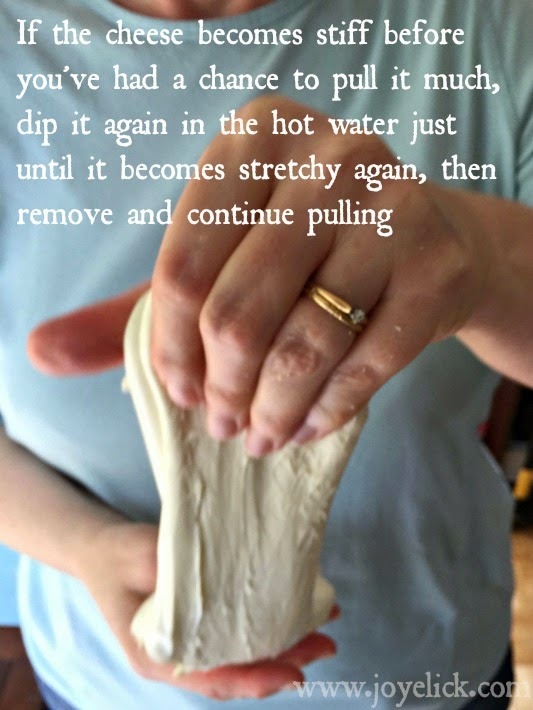 Remove the mass of cheese from the mold and begin pulling. It will be quite hot. (Some people like to use rubber food-service gloves for this part). Stretch the cheese like pulling taffy. The salt will get worked in as you go. Stretch and fold the cheese back on itself over and over. If the cheese doesn't stretch well enough, heat it again by dipping it in the hot water for another minute then begin again. 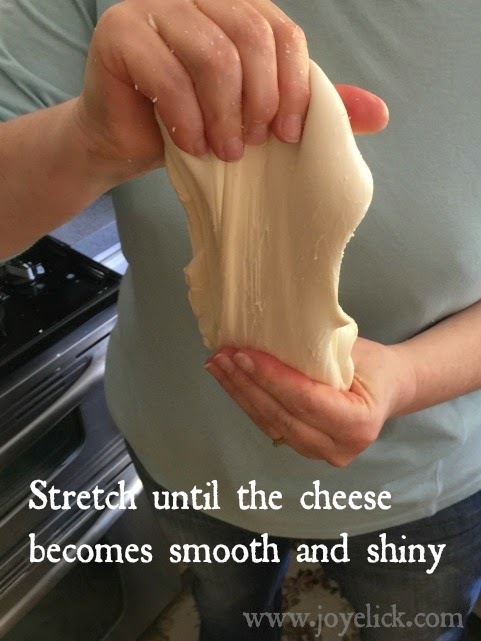 Stretch until the cheese becomes smooth and shiny. When the cheese is done, shape it into a ball and submerge it in a bowl of ice water for 15 minutes. This is important. It protects the silky texture you've created in your cheese and keeps it from becoming grainy. 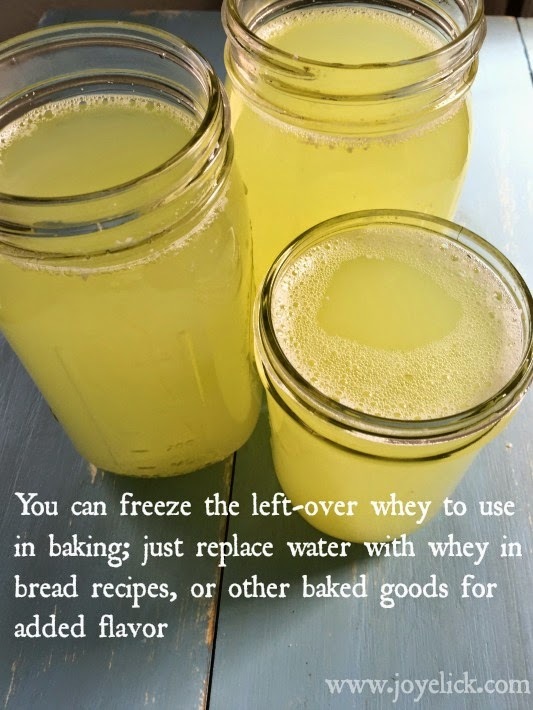 A NOTE about the whey: Don't throw out the left-over whey. This can be used in baking, or added to smoothies. It's especially tasty in bread. Whey adds flavor and protein to foods. Just replace the water with whey in any given recipe. Store the whey in your freezer until needed. Step 13: Eat or store. Fresh mozzarella is a real treat! 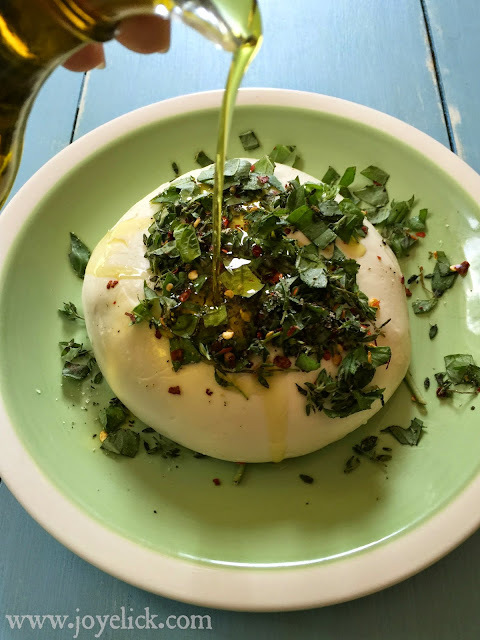 If you want to eat it right away, you might try this: Cover the top of the cheese with fresh chopped herbs, such as basil and thyme, red pepper flakes and salt. Drizzle olive oil over the top and place cut grape-tomatoes around the edge. Serve as an appetizer with sliced French bread and separate small plates of olive oil and balsamic vinegar. The bread can be dipped in the oil and vinegar and eaten with slices of the fresh cheese with herbs. It's delicious! Storage. If you want to store your cheese, just wrap it in plastic-wrap and place it in an air-tight container in the fridge. Use within 1 week. Let's chat. What food items have you always wanted to try making at home, but you've always been freaked out about trying them? I'd love to hear from you in the comments below. I've made yogurt before. You have inspired me to try my hand at mozzarella! Nice! I hope it's fun for you. How did you like making yogurt?